Chrichton's World: Review Unleashed a.k.a. Danny the Dog (2005): One of Jet Li's best! Review Unleashed a.k.a. Danny the Dog (2005): One of Jet Li's best! 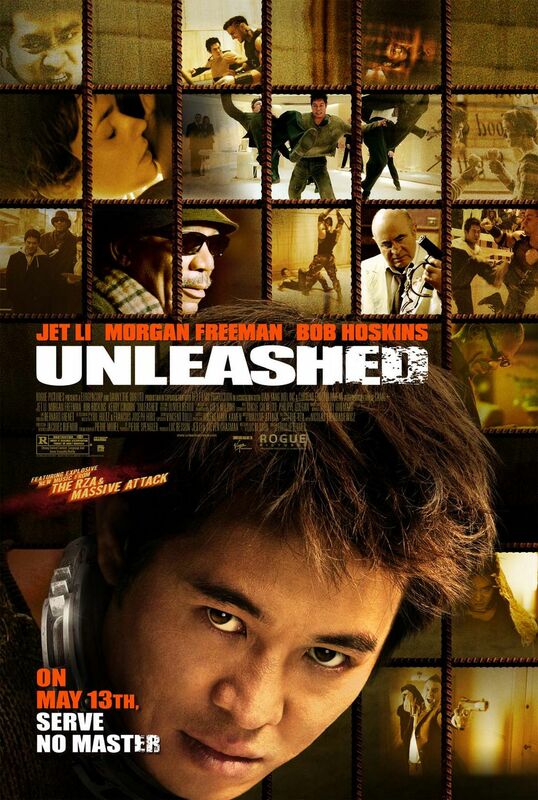 Unleashed is an example what you can do if you pay attention to story and fight choreography. The story in Unleashed is a compelling and touching one. And dare I say that this is one of Jet li's best roles acting wise. Danny (Jet Li) is adopted by crime boss Bart played by Bob Hoskins. Or rather that is what Bart himself claims. Danny is not treated kindly or lovingly at all. He is enslaved and basically is used as an attack dog having to obey Bart's every command. He is trained and conditioned in such a manner that every time his collar comes off he has to attack and kill the people he is ordered to. One day though Danny meets a very kind man who treats him like a human being and gets distracted from what he is supposed to do. When things go very badly he comes back to the place where he met this man and is taken in. Here he is treated with all the love and care he had been denied all his life. This man is Sam played by Morgan Freeman. Both he and his stepdaughter Victoria show him a world of art and beauty. Het Li is really good as the enslaved man who is getting back in touch with his humanity. An extremely endearing and touching story that actually makes Bart seem one of the worst and evil villains ever. Who am I kidding? He is one of the most evil villains displayed on the screen. He is relentless and immensely selfish. Anybody who thinks he can treat and own people aren't quite right in the mind. But Bob Hoskins adds to his character since he obviously is enjoying himself playing this evil crook. The gripping drama helps intensify the action that is choreographed by Yuen Woo-Ping. It's a sheer delight to see Jet Li crush heads and bones like it's nothing. Especially later when he refused to hurt or kill his opponents. But I guess some people are tired of living. I think that this is one of those rare martial arts flicks that transcends the genre and also is appealing to people who normally don't like these types of films. So what are you waiting for? Go watch this classic already. You won't be sorry.